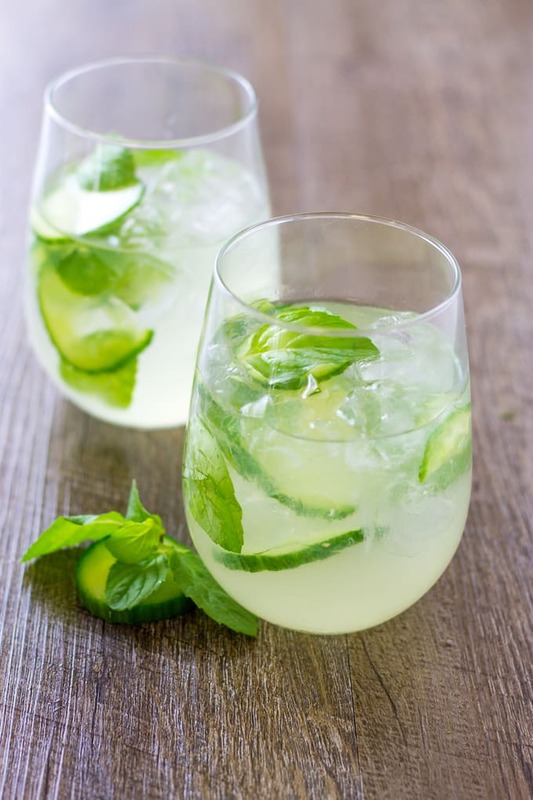 This crisp cucumber mint gin cooler with a homemade sour mix is the perfect way to feel like you are enjoying a spa refreshment but still adulting with a cocktail! Summer is not over yet and I am still sweating away in Arizona! Trying to stay hydrated and still get my drink on is difficult but this cucumber mint gin cooler is doing the trick. I am not going to lie and say that I only drink these on the weekends. Day drinking, even weekdays, is a necessity when you are a food blogger. 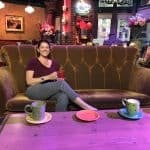 Under my credentials, it says Jennifer Stewart, Gluttonous Grocery Shopper, Horrible Dresser, Ice Tea Guzzler, Dirty Dish Creator, and now Day Drinker. When am I supposed to do all my recipe tasting? I can’t just write down some ingredients on a piece of paper and hope they taste good before I put them on the interweb! Now don’t freak out because this is the first gin cocktail I have made. I have never been a gin drinker but I am not one to turn down the opportunity to try a new spirit. You have to try everything at least once! Unless you are allergic to it!!! I can’t believe I need to state that but there you go. I even try things that I haven’t like previously just to make sure that my taste buds haven’t changed because those finicky little buds change all the time. Look at me over here eating cinnamon and ginger now! Now, this Cucumber Mint Gin Cooler was a surprise to me when I made it. I have been looking to make a cocktail with gin all summer when I started my 3 Ingredient Cocktail Series. In the series, I use tequila, beer, bourbon, amaretto, and even prosecco. How have I not used gin before? Oh yeah, not a big fan. Why is it only one garnish? Why not both? What about the different liquors requires two vastly different garnishes? Hold on and I will give it a test. I can see why cucumber is better with the Hendricks. The cucumber is complemented and enhanced with the Hendricks, more so than the Bombay. Google helped me when I simply searched why you garnish with a cucumber and it answered with Hendrick’s uses cucumber when they make their gin. Enough about all that, let’s get back to the cocktail. 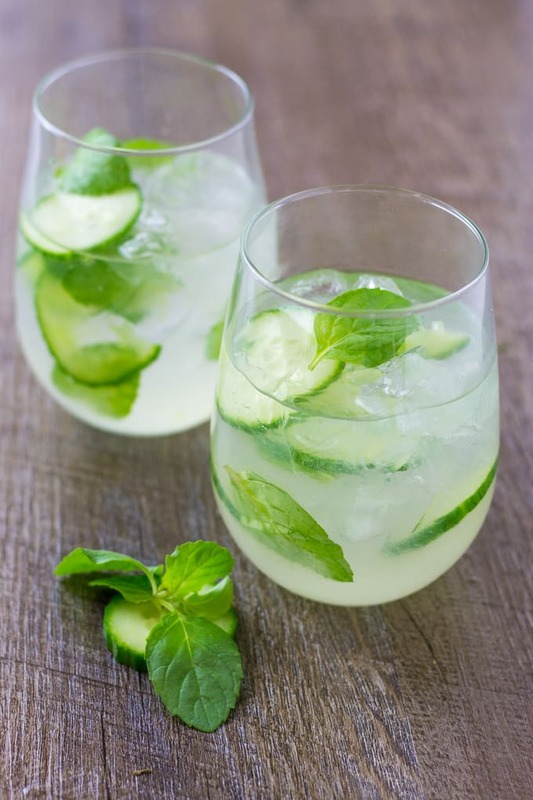 The Cucumber Mint Gin Cooler came about when I asked my friend Chrissy, who drinks gin, what she likes with hers. She mentioned recently having a cocktail with cucumber and mint. Having some flavors is a great starting point so I grabbed the gin, cucumber, and mint and headed to the kitchen. Muddled cucumber, bruised mint, and gin. What next? Let’s even it out with some sparkling water because I am not a fan of tonic water. It sounds like something a “healer” from the 1800s would sell. And it is too bitter with the gin for my taste buds. It needs a little sweetness to even it out. Lemon-Lime soda (pick your fave) is my go-to cocktail leveler but it is not enough. How about a little sour mix? The other citrus will help round out the cucumber and mint, I feel. Traditional sour mix tastes so fake so I decided to make my own and use honey instead of regular sugar. BOO-YAH! That little bit of homemade sour mix did the trick. How do you make a homemade sour mix for your cocktails? First off let’s talk about what sour mix is. Sour Mix is a combination of lemon juice, lime juice, and a sweetener. Most store-bought sour mixes are full of sugar and artificial lemon/lime juices and other “natural” flavors. Forget all that mess and the fake neon color that comes with it. Making homemade is certainly better. The recipe for a homemade sour mix is simple. Equal parts of water, sugar, lemon juice, and lime juice. For my recipe, I left out the water and just used the juices and the sweetener. 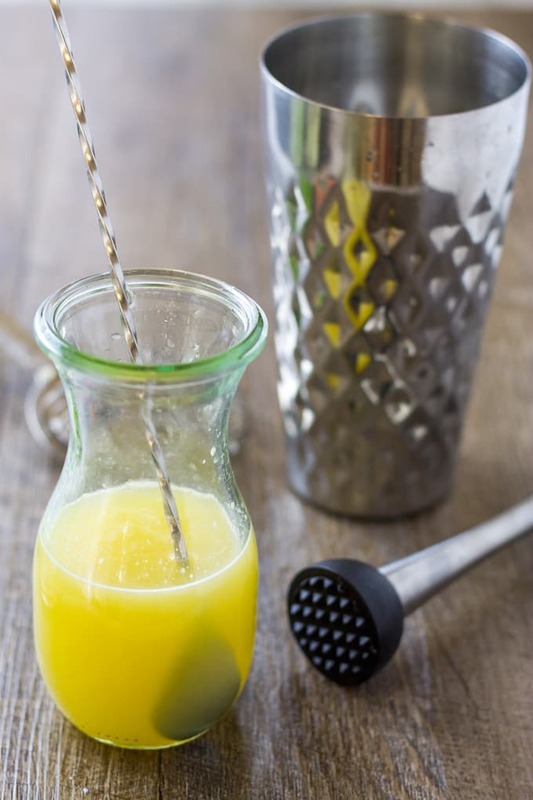 Freshly squeezed lemon and lime juices are best so get ready for a marathon session of squeezing that juicer. Instead of using sugar, I chose raw honey. If you want to warm a little of the juice it helps the honey to dissolve fully otherwise you will be shaking the mix for a long time. Leaving out the water means that the sour mix is stronger than the premade stuff, so you won’t need as much. This recipe makes 1 cup of homemade sour mix and this recipe only uses 1 tablespoon per cocktail so you will have to store the unused sour mix in the refrigerator until next time! 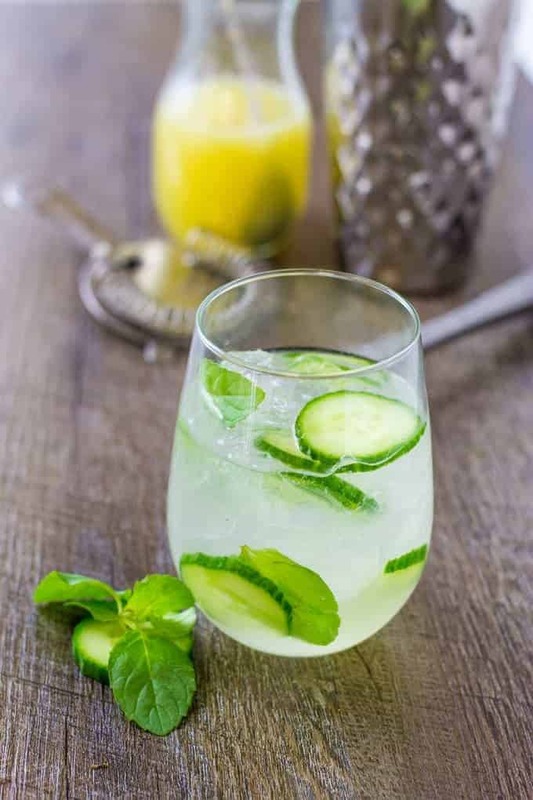 My Cucumber Mint Gin Cooler with a homemade sour mix is perfect for weekends, nights and even during the day! Combine the honey and the juices together in a closeable container and shake the mess out of it. The honey will be thick so make sure you get it all combined. Store this in the fridge for up to 2 days. 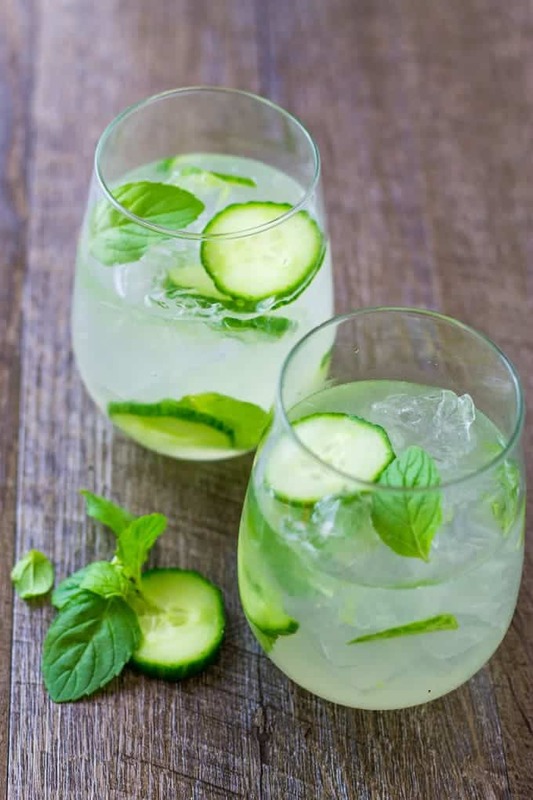 Muddle the cucumber slices and mint in the glass. In a separate shaker or container, combine the gin, sour mix, and sparkling water. Pour over the ice and stir or mix by pouring into another glass and then back into the first one. 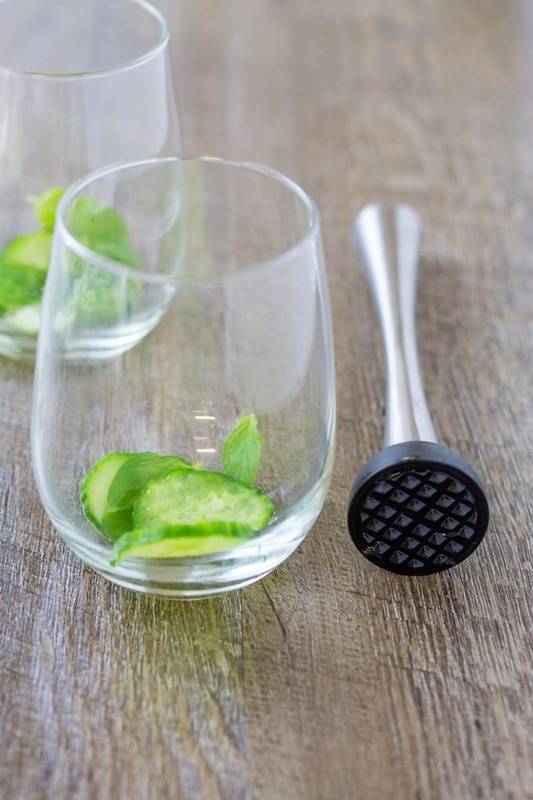 Garnish with cucumber slices and mint sprigs. Sounds Fabulous! Thank you for giving us a recipe for a homemade sour mix..